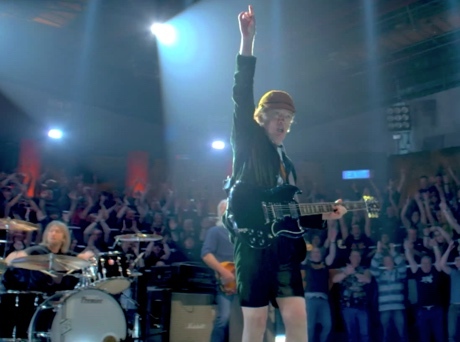 Classic rock riff-mongers AC/DC have an album called Rock or Bust due out on December 2 through Columbia Records, and they're building up anticipation with a music video for the title track. This simple clip resembles a simplified version of the video for "Thunderstruck," as we see the band performing while surrounding by a ring of of fist-pumping dudes. The band crank out crunchy riffs and are encircled by a whole lot of denim jackets and bald spots, so kudos to them for sticking to their guns. Notably, this performance video is missing dementia-suffering guitarist Malcolm Young and legally embattled drummer Phil Rudd.